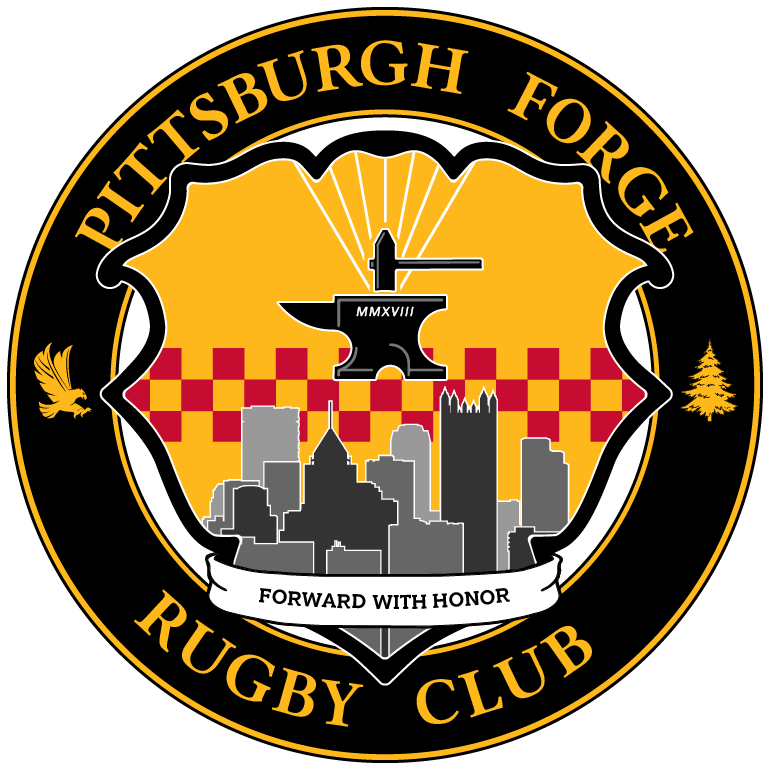 Forward Tony Cardamone breaks the defensive line against Scioto Valley Rugby Club on Saturday, August 11, 2018 at Founder’s Field in Indianola, PA.
INDIANOLA, PA – This past Saturday, the Pittsburgh Forge Men’s Side opened up their Fall 15’s season with a preseason friendly match against Scioto Valley Rugby Club, a Division 1 club from Columbus, Ohio.  The fixture was held at Founder’s Field in Indianola, PA about 25 minutes north of the City and had a scheduled for a first side kick off at 1:00 PM and a second side kick off at 3:00 PM. The clubs avoided some earlier morning showers and played under beautifully sunny and warm conditions throughout the entire game. The Forge Men kicked off and were able to gain possession quickly just outside the Columbus 22-meter line. After several phases, possession was lost due to a penalty after attacking to 10-meters out. 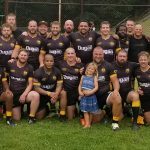 Scioto Valley was able to counter-attack, but the Forge’s defense was stout as they clearly showed they could hang with the higher division side boasting a number of players from the Ohio Rugby Union’s Select Side. After several minutes, the Forge was able to regain possession and move the ball into the Scioto Valley end of the field once again. Flyhalf Tyree Massie (Cal U) was able to make some space for center Stephan Patterson (PITT) who was able to exploit the gap and open up the game’s scoring. 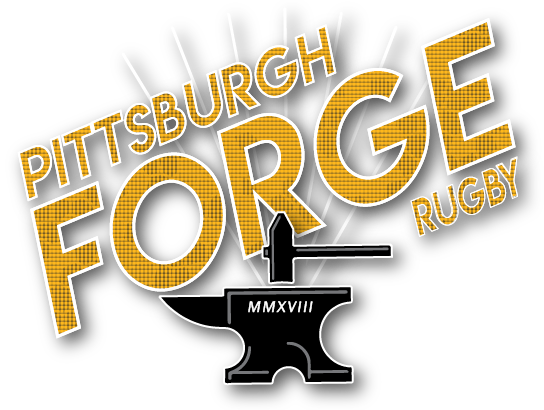 Andrew Knuttel (PITT) added the conversion and the Pittsburgh Forge jumped out to a 7-0 lead after ten minutes. After the subsequent kickoff, the Forge went on attack again once again moving the ball inside the Scioto Valley 22-meter line. A turnover allowed Columbus to quickly counter-attack and catch the Forge flat footed on defense. After a line break and long run from Scioto Valley, winger Yhong Thepboon was able to make a try saving tackle that allowed time for the Forge defense to get reorganized. After several minutes of Scioto Valley not being able to break the try line within ten meters, they finally scored after some great defensive play by the Forge. The try, along with the conversion, tied the game 7 – 7 at the twenty five minute mark. 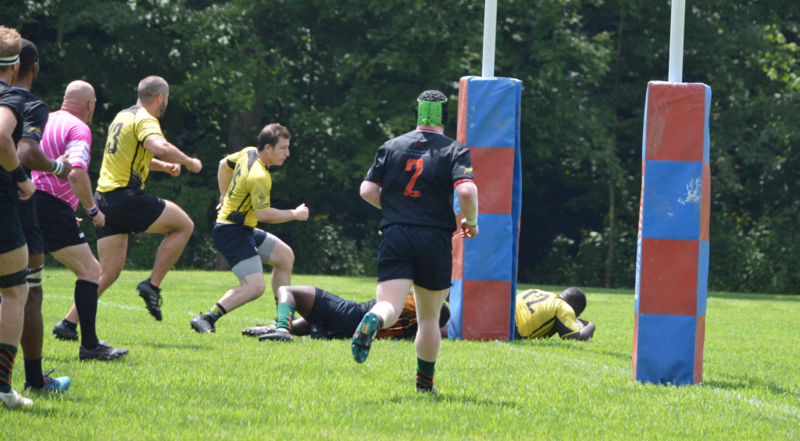 Center Stephan Patterson, from the University of Pittsburgh, places down a try to open the scoring for the Forge against Columbus Rugby Club. After the next restart, the Forge were able to regain possession and threaten again. 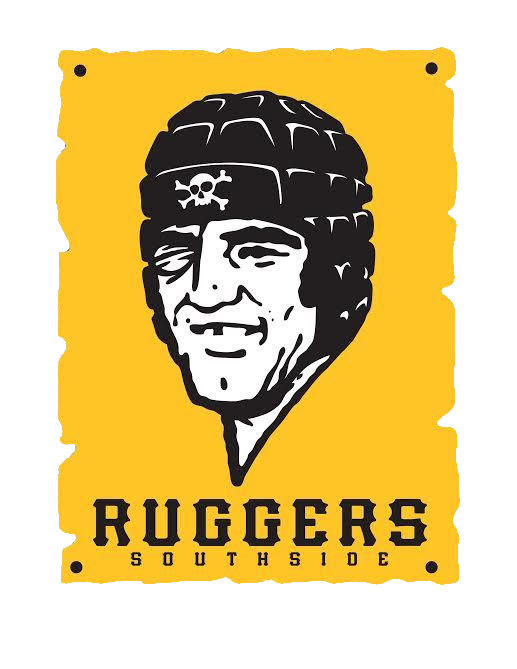 A yellow card was issued to Columbus for foul play, and flanker Alex Gordon (SRU) was able to power his way into the try zone after some tough runs from winger Corey Jacobs and flyhalf Tyree Massie. The kick was converted by Knuttel and the Forge was in the lead again 14 – 7. 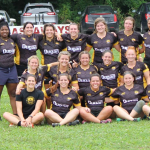 Shortly before half, however, Columbus was able to sustain some offensive pressure, particularly from their talented outside backs, and add an unconverted try as the whistle blew. The Forge’s lead was cut to 14 – 12 at the half. The second half of the game featured the Forge playing significantly more defense. Scioto Valley would put attack after attack together, but the Forge held tough and would force an error or generate a turnover with stifling defense to thwart any real scoring opportunities. The Forge did make some mistakes that thankfully wouldn’t cost them as Columbus would be granted two opportunities to score penalty kicks from just outside the Forge 22-meter line. Fortunately for the Forge, each kick was missed. In the final fifteen minutes of the game, the Forge would make a mistake that landed forward Cody Fulton (Harrisburg) in the sin bin. Down a man, the Forge still battled to defend Columbus who had deadly, try-scoring wingers on the outside. As time ticked by, the experienced Columbus team would get the ball wide and score a converted try with just a few minutes remaining on the clock, taking a narrow 19 – 14 lead. Now a five point deficit, the Forge would have one final opportunity to try and win the game as they kicked off to Columbus once again. Again, after gaining possession of their own kickoff, the Forge was able to sustain attack down the field, inching towards the Scioto Valley 22-meter line. Unfortunately, time would expire and the Forge would come just short of earning a win in their first fifteens game. 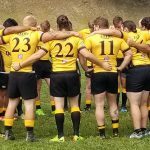 Coaches Stephen Walsh and Allan Murray address the team during the half to make adjustments against Scioto Valley RFC on Saturday, August 11, 2018. Overall, the coaching staff and players were very pleased with the game. After only four training sessions and limited time playing with one another, the Forge showed that they could compete with a very good Division 1 side. Defense and communication in particular were highlighted by the coaching staff as positives for the gelling club. For the second side match, Scioto Valley only traveled with about a half of a squad. Throughout the match, more Columbus players were replaced with Forge players until the final fifteen minutes featured solely Forge players playing one another. Scoring was not tracked, but the time was well spent learning and getting a great run in under the warm summer sun. Next up, the Forge Men will be traveling to Wheeling Jesuit University to take on their first and second sides in a preseason friendly match up. This will allow the Forge to not only train against a top tier squad, but also build relationships with one of the most prestigious collegiate programs in the area. Kickoff times are set for 4:00 PM and 6:00 PM at Bishop Schmitt Field in the heart of WJU’s campus.